Potatoes are kids all time favorite food. Pringles, lays chips are some of my favorite potato chips which i often go for store bought. 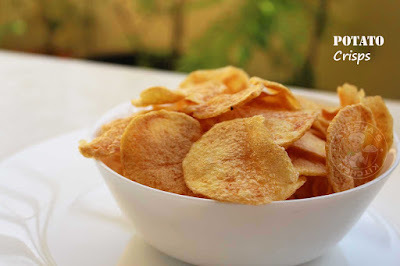 I do love crispy and crunchy potato chips for snacking after my lunch meals. Do you have the habit of enjoying chips while watching movies? Do you stick to your favorite chips for refreshment? So why can't we try this crispy potato chips at home? I am asking this question to myself for long. 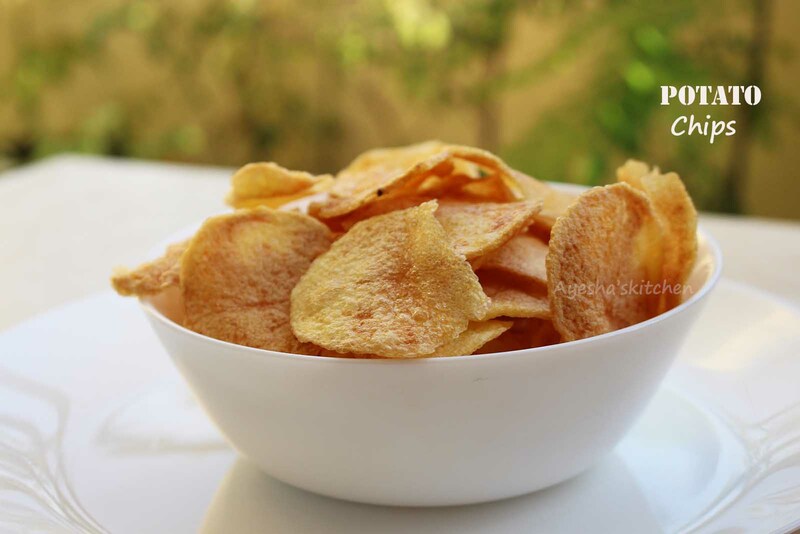 Making potato chips at home gives the great experience of enjoying the freshest chips ever. But whenever i tried to replicate the same store bought potato chips, the final result will always let me down. Finally i got a perfect recipe that shows how to make perfect crispy thin potato chips at home. 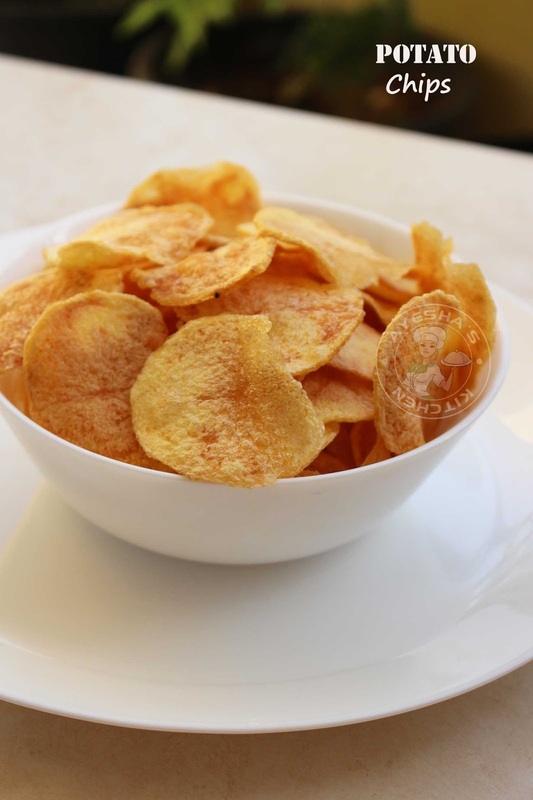 Keep in mind - making homemade potato chips is quite simple but you must follow some long procedures for the perfect result. Trust me , its worth trying. I made this few weeks backs for a crowd of picky eaters. I was struggling for a bowl of chips for the final pic. Though it took several batches for me to fry, it vanishes within seconds. That moment i feel incredible. Few tips - You have to choose the fresh potatoes from grocery for making chips. And pick those potatoes which are not sprouting. Potatoes must be sliced evenly and make sure that they are soaked in water well (helps to remove starches and increase crispiness ). Boil the sliced soaked rinsed potatoes in vinegar mixed boiled water for 3 minutes which gives a perfect texture and crisp to the chips. You have to dry out the water content in potato slices using a paper towel several times. Hope you all try this recipe for sure. A potato chips or crisp is a thin slice of potato that has been deep fried or popped until crunchy. You can enjoy this as a snack, appetizer or side dish. Isn't it? Store bought potato chips includes artificial flavor and additives which cause many health issues. So i hope this recipe for potato crisp will be kids friendly for sure. A must try recipe for all snacking lovers. I am sure that this recipe will be a great addition to my potato recipes album. Here is the recipe showing how to make crispy perfect potato chips / crisp /potato chips /make your own chips /crisps chips /chips recipe /homemade chips /crispy home fries recipe /hand cut fries /how to make fries / potato slices. Select the fresh potatoes for making chips. Peel the potato and slice them evenly using a slicer. Immediately soak them in cold water (i just added few ice cubes too). Wash thoroughly and rinse with fresh water several times (this helps to remove starch from potatoes). Drain it. Boil water in a pan and once boiled, add salt and vinegar. Once boiled, reduce the flame to medium and then add the drained potato slices . Cook for 3 minutes (do not ever cook more or less) in this vinegar salty water. Once done, drain it to a colander. Again rinse them in water and drain. Meanwhile, heat a deep bottomed pan and add oil for deep frying. Drop the slices on by one. (fry in batches and do not over crowd). Stirring constantly and flipping until potatoes release no more bubbles. Cook for 10 - 15 minutes over a medium flame only. Transfer to a paper towel once done. Check for salt and if required sprinkle salt and chili powder. You can store them in an air tight container once cooled completely.